The Shortest and quickest route to Ullapool from Fort William is to follow the A82 towards Inverness, cut north at Drumnadrochit and then onto the A835. That route covers 110 miles according to Google Maps. Even given my lazy attitude to miles if we leave Fort William at 0900 we'll be in Ullapool at lunchtime. It will be much more interesting to catch the ferry from Mallaig onto Skye and give Mark the opportunity to see some parts of the marvellous Highlands he's not explored yet. I reckon if we catch the 1215 ferry we'll still be in Ullapool by tea time which sounds ideal. My only gripe is the cost of the ferry, I do recall it's not cheap. The wee beasties are out this morning - but I'm ready for them! The road from Fort William to Mallaig is legendary. It is a majestic collection of fast straights, perfect bends, undulations and grippy road surfaces. Regrettably for poor Mark he's still stuck behind a 125 rather than a supersport 600. In fact this is one time where I too am wishing I was on a big fast machine. I do love my 125 but...but...but with a road this fast and this much fun I can barely reach the speed limit on the downhill sections and uphill progress is woefully lethargic. I console myself with memories of when I shredded this road on my Fazer 600. We stop at Glenfinnan where Mark wanders off to get some shots of Bonny Prince Charlie's statue on it's plinth and I'm accosted by an American couple in a hire car looking at my 125. The chap enquires as to whether or not I'm allowed a "bigger sickle" and I tell him I am. I can see he wants to ask why I have chosen a small "sickle" but he doesn't and I don't offer an explanation. This makes me chuckle inside my head. He's probably chuckling inside his head too thinking "Dumb eccentric British weirdo long haired hippy." Bonny Prince Charlie stands over the grand scenery as the skies darken. As we approach Mallaig the rain starts, mercifully it is merely a light drizzle. I've made sure we arrive with at least an hour in hand to ensure we can sort our tickets. If after that there's time to spare we can always stroll around the harbour. As we roll up to the fluorescent man at the entrance he say's "Have you booked?" 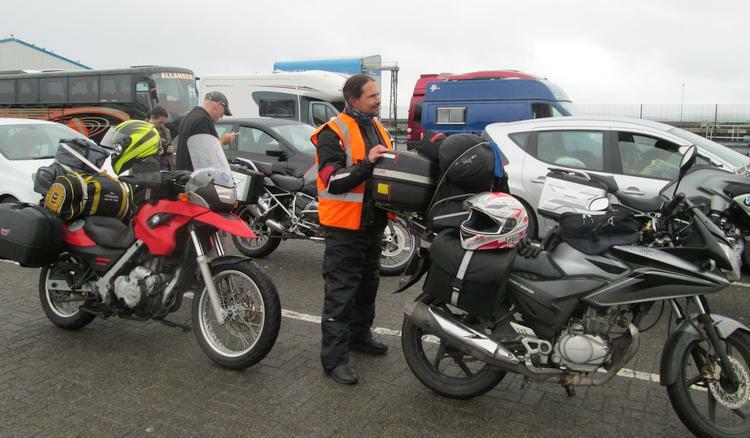 "No, we'll do that now"
"Well the next ferry you can book is the 1345, the 1215 is fully booked"
"Even for bikes? Come on - we don't take up any space." "Even for bikes." and he gives me an authoritative stare. Damn. I discuss our options with Mark. Either we ride all the way back to Fort William and take the short route to Ullapool - not what we'd set out to do really. Back to Fort William then around to The Kyle Of Lochalsh then Ullapool? That's another 200 miles on top of the 45 we've already done and time is very much against us now. Or wait for the ferry. It will mean a wait here in Mallaig and we'll have to press on a bit after the crossing but at least we'll do that which we set out to do. We decide to wait. But first we'll book onto the ferry right now to ensure we get across. Grrrrr. £16.90, I think I'm going to faint. The next 2 hours are spent in a cafe sipping hot tea and watching the rain gather momentum outside then walking around the harbour. The rain comes and goes and the skies are leaden. Still, I can think of far far worse places to be though. We get to see "The Jacobite" steam train chuff slowly out of the station. There are no seals in the harbour waters today so we inspect the rusty trawlers instead. It's not a painful wait and soon enough we're at the front of the queue looking out for the ferry. The Jacobite heads out of Mallaig station. The crossing is uneventful and as soon as we're off the ferry at the other side I get my head down and scream the 125 motor in order to make some progress, only to be held up for the first 10 miles by a car actually travelling slower than me! He's moving at that awkward pace where I could go faster but I have neither the power or a clear downhill stretch to make a safe overtake. We try to take a picture of the Skye Bridge from The Kyle Of Lochalsh, the weather has other ideas though as a heavy mizzle allows us only to see only the merest outline in the distance. "I want a photo of the Sky Bridge" "Yeah, sorry about that Mark." And yet at The Eilean Donan Castle some 7 or 8 miles away the rain has stopped and the air has cleared. I'd describe this weather as "changeable". After another brew the A890 is bathed in sunshine and the road starts to dry as I give it the beans in 3rd gear to crest a steep hill. Town like Inverary, Fort William and Mallaig are surrounded by beauty, here as we head away from Loch Carron that beauty becomes desolate and remote. There is human activity here of course because there are fields, sheep and even train tracks but it's easy to imagine being stranded here on a cold winter's night and feeling an awful long long way away from any kind of civilisation or warmth. 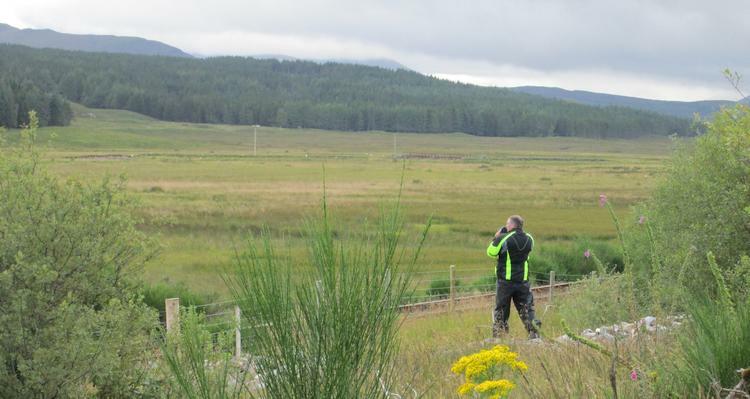 Mark "Ray Mears" goes all wild and native in the Highlands. Space is a curious thing. Back home between the conurbations of Manchester, Liverpool, Preston and Blackburn there is so very little space. Here in the Highlands there is plenty and I feel as though I can breathe deeply, move freely and stretch out my arms and legs without fear of knocking a table over or breaking into someone else's personal space. I love it and it draws me back to Scotland time and time again. Yet here I can also conjure into my mind the feeling of total isolation and loneliness. These emotions are scary and I play with them as the road winds on. Scary, but scary like a fairground ride is fun scary. I giggle to myself as the train tracks come back into view. Remote my arse, silly boy. The rain returns with aplomb as we get closer to Ullapool on the A835. It's a little frustrating but I have accept conditions have been favourable for us and even this inclemency is unexceptional as it's not cold and it is well timed at the end of our ride. It is 1815 as we roll into the Broomfield campsite and it only takes a moment to spot where we're supposed to be. Oh, didn't I explain? We've made this long and arduous journey to attend a rally. 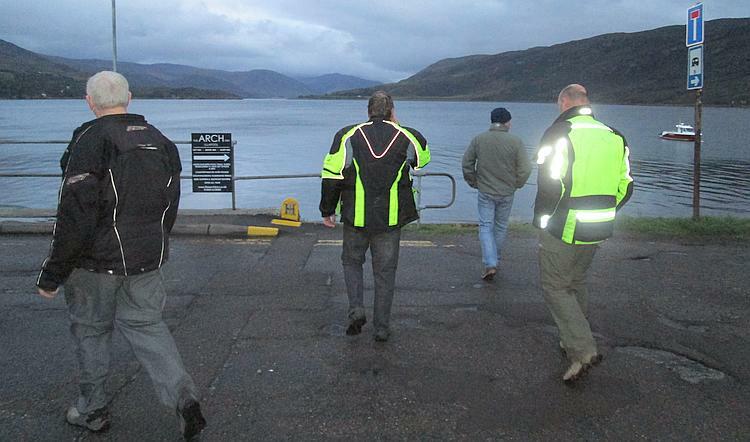 This is the Adventure Bike Rider Forum's Ullapool rally. There's an obvious area with a collection of BMW GS1200s as expected, several other big trailies, the odd enduro or adapted motocrosser, a couple of road machines and then there's me on my 125. We sign in, pitch up and I make a brew - I'm gasping for more tea after our soaking. There's one thing you ought to know about the ABR Forum's rallies. Unlike most bike rallies these are primarily a gathering of people as opposed to the more traditional routine of bands, beers, silly games and burger vans. I had tried to explain this to Mark but as he looks around his face paints a picture of realisation. The organisers have laid on a small shelter to sign in and some remarkably cheap tins of beer. That's it. Hey! I'm not complaining this is exactly what I am expecting, this is exactly what I was told to expect and this is exactly what I want. What makes me happy is the price for the camping, the organiser's have done something special there. Mark also invited a friend from work and this friend has brought along 2 more friends. They're not roughty toughty adventure biker types like Mark and I, they're not camping but staying in a hotel just 3 minutes walk from our campsite. It takes some organising but soon after a chippy tea we're sat in a pub and talking like we've known each other for years. They tease Mark and I with tales of how warm it is in their luxurious rooms, how their bike gear is drying out, how plush their mattresses are and of how they'll eat their big breakfast. We retaliate by advising them of our cost savings and the fact we're real men. It's not working. "Who's round is it?" I guess that's my queue to run away then. A Head Full Of Ayr Ren and Mark set off to the Ayrshire coast. Ren is pondering the way he travels and Mark is probably bored to tears behind him. Into Scotland Proper Mark and Ren ride into the breathtaking beauty of the Scottish Highlands. With good weather, impressive surroundings and a gentle pace it is a good day to ride. Waiting For Ullapool Mark and Ren go through a mixture of sunshine and rain and waiting and rushing on their way to their final destination, Ullapool and the ABR rally. A Perfect Day Exploring A day exploring the Achiltibuie Peninsula alone gives Ren the chance to be selfish and self indulgent. Here the 125 is the perfect machine for the job too. An Easy 200 Miles With favourable weather and winds the start of the journey back home makes for some easy miles. Ren is starting to realise that he's in his comfort zone. Is that a good thing? Horse's Heads With No Bacon Art and Ren don't really mix too well. He appreciates the engineering though. There's also a wobbly bridge and no bacon butties. Home And More Photos The final leg of the Ullapool trip just sees Ren on the motorway home with his thoughts. So to make it more interesting there's a collection of fabulous images too. I am a huge fan of Scotland. It is rare here in the UK to find anything that remotely resembles wilderness, this is a populous country and I live in a highly populous area. There is space to breath in the Scottish Highlands and places where you can ride for several hours and only see a handful of cars. I'm sure it's still busier than the remote parts of Scandinavia. Newcastle would give you good access to Scotland. You do need to get past Edinburgh and Glasgow before you hit the best areas. 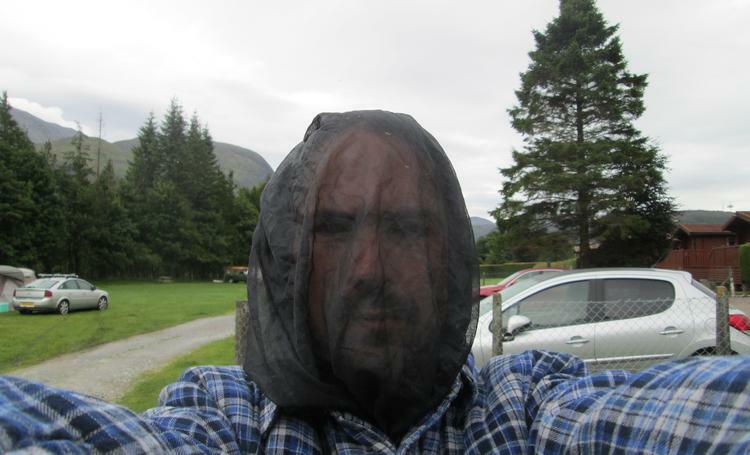 And beware the Highland Midge, they are evil critters. Midge - tiny fly that bites - do you have them in Denmark? I suspect you will. Thanks, worth considering, the hard thing for us would be to choose between two trips to Norway, or one trip to Scottland :-) they are not the same, but can be compared in many ways, I like this nature just as much as you, and also on a general note a avoid city's, if possible,..
You have small devils! Urgh. Is there nowhere safe from these tiny monsters?